It can be hard to find solid, new corporate worship songs for your congregation, especially if you don’t subscribe to the “one-size-fits-all” mentality of only pulling from the CCLI Top 100. Well, I collect new songs year round, listen, play along, & analyze to see which ones float to the top – that’s to say, I’ve done some of the work for you. Here are my most recent picks. I reviewed Matt’s latest right HERE, but on the short, Matt is a worship leader at Harvest Bible Chapel, a regularly appearing musician in the Vertical Church Band, & the Founder/CEO of the Loop Community. I’ve already added “Praise our God” to Saint Lewis’s live set-list, & hope to use it corporately soon as well. It’s a strong, mid-uptempo Call-to-Worship anthem, with a strong melody, & chorus that is both classic/historic/Biblical (“To Him to sits on Heaven’s throne…“), & quite original, feeling like a “breakdown” (if it were driven my distorted guitar instead of synths, a mosh-pit would break out) – it’s really quite powerful on it’s musical merits alone. Necessary listening for all of you worship pastor audiophiles. (If you’d like to check out the original version by Housefires, you can find it HERE) Have you ever loved a song, then heard a new version that made you love it EVEN MORE? I mean the song tapped right into that simple love for our Heavenly “Daddy”, but then the new arrangement added that cool walk-down, & even more depth & beauty. This is this generations’ “How He Loves” – the song will be around for a long time. You might as well just add it to your set list now. Trust me. Though you might not immediately recognize his name, Jonathan is a deeply anointed worship leader & a gifted songwriter whose songs have been recorded by the likes of the Newsboys, For King & Country, Mikeschair, and Phillips, Craig, & Dean. And of all of those songs, the one I return to again & again as a worship leader is “Greater is He”. Bold in proclamation, & immediately singable by congregations, it’s a personal favorite at my current church. Having only met Corey momentarily one thing is immediately noticeable: the young man exudes Spirit-filled joy. That same joy bubbled over from the hymn-like “Praise the King.” It’s simple melody makes the song immediately multi-generational, perfect for youth, contemporary, blended, or traditional services alike. In fact, I can’t wait to hear someone attempt this with a huge gospel choir – it’s begging for it. 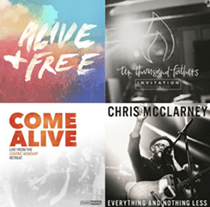 Most know Chris for his contribution to “Your Love Never Fails”, made famous by both Jesus Culture & the Newsboys, but his contributions to the modern worship catalogue run much deeper than that. Recorded with Jesus Culture in California, his latest CD is heart-felt & beautiful. The title track is my personal favorite. A deep, passionate cry of surrender, “Everything and Nothing Less” waves a White Flag before the Lord, offering His quite literally everything. A great corporate song, but also a wonderful “special” during offertory in more traditional churches. I recently reviewed Stephen’s latest HERE, but the more I listen, the more songs that stand out as possible corporate numbers. That said– it’s particularly hard writing hymns. In fact, it’s so hard that – technically – much of what we consider “hymnody” isn’t, because a true “hymn” (as the term has historically been used, & is still used by professional musicologists) doesn’t bank on a catchy chorus to hold a song together! Originally hymns stood on the beauty of their prose to express, & unpack the beauty of truth – a poem, built verse-after-verse. This is the song I’ve always wanted to write. I’ll have another collection of new songs ready for you next month – until then, I hope these bless you & your congregation! So, fill me in: what new worship songs have you introduced of late? That’s a fantastic idea – I’ll have to try it soon! Thanks for posting!